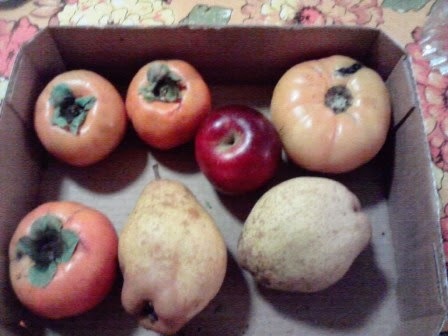 This week a friend brought me some Japanese persimmons from her tree. I’d never had any before and discovered they are delicious sliced thin on spinach or arugula salad, with olive oil, red wine vinegar, salt, and pepper. Their color alone is a welcome blast of brightness on a gray fall day. Today at the Tuscaloosa farmers’ market I was able to buy some Arkansas Blacks—a variety of apple I’d heard of, along with another, Ben Davis, from my cousin Jim Few, but had never gotten to try. The skin is reddish, but on the darker side of red, and the flesh is crispy and firm. It reminded me most of a MacIntosh. Despite not having tried one until now, I’ve already titled a short story with the name: “Arkansas Blacks” will appear in the collection Tell the World You’re a Wildflower, coming out from the University of Alabama Press in Fall 2014. Given my home state’s history with school desegregation, a reader might initially assume that the plot will have something to do with race. In the story, however, two sisters grow up on an apple farm, and the Arkansas Black is one of the varieties they grow. We came around the corner of the house, our mouths purpled with berry juice, and in our father’s excited state—he had seen the smoke and come in from the orchards—we must have looked horrific, like ghouls. He screamed. Then he shouted at us: “Where have you been? You’ve killed your mother!” We believed him. He himself looked like a spaceman, garbed in protective gear and mask for spraying the trees, which were under attack from worms. The Arkansas Blacks, with their characteristic shiny, dark peels, were hit hard by the worms. Like everyone else, we had Ben Davis trees too, but they were not much good for just eating. Yesterday I got the copyedited files of Tell the World by email to review. Just now, writing “copyedited,” I debated whether a hyphen should go between “copy” and “edited.” I’m partial to hyphens, but the Chicago Manual of Style, which the Press uses, is not, and Webster’s, the standard dictionary, tends to combine rather than separate words like “backseat,” so I’ll need to go through and consider the closed up (closed-up?) words on a case-by-case (case by case?) basis. I’m glad the editor flagged these things for me to think about, and after a quick review of the document I’ve already seen at least one instance of her saving me from an error that would have been distracting or confusing to readers. Lots of details—but it’s exciting to be at this stage in the book’s life. After the copyeditor is finished, the book will move on to design and then production. If it takes a village to raise a child, it takes a publisher—one with experience and expertise—to create a book.